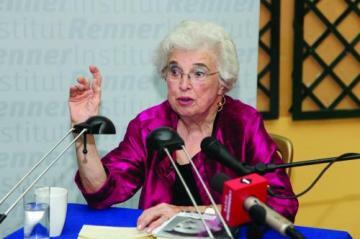 Gerda Lerner in 2002 speaking at University of Wisconsin-Madision, where she founded the PhD program in Women’s and Gender History. The restoration of half the human race to the historical record has led to consequences beyond anything Lerner could have imagined at the start of her career. When scholars started peering over the formidable shoulders of such “great women” as Susan B. Anthony and Elizabeth Cady Stanton, and began researching and analyzing the traditional stuff of the vast majority of women’s lives—pregnancy and childbirth, child-rearing and housework—a picture of humanity with subversive implications emerged. …Little wonder that the insights of women’s history have proven contagious, inspiring the LGBT community to discover its own place in the past. Enjoy Leleux’s excellent tribute, “Matriarch,” here. Gerda Lerner, former Sarah Lawrence professor and co-founder of the women’s history graduate program, the nation’s first, died on Jan. 2, 2013 at the age of 92. In addition to her work at Sarah Lawrence, Lerner founded the nation’s first doctorate program in women’s history at University of Wisconsin, Madison, was the author of many scholarly works, including “The Creation of Patriarchy” (1986) and “The Creation of Feminist Consciousness” (1997), and became one of the early female presidents of the Organization of American Historians. The New York Times chronicled Lerner’s life in an obituary, published today. The staff here at Re/Visionist and the members of the Women’s History Graduate Program at Sarah Lawrence College honor this formidable woman, and as we consider ways to formally pay homage to her life and work, we encourage you to contribute ideas, thoughts, and inspirations you might have. Thank you, Gerda Lerner. Your life’s work is eternal and immeasurable in value and power.